The panelists are top experts in their field and are ready to answer your pointed questions on security, defence, intelligence and foreign policy that the recent terror attacks have raised. You can clarify your questions and doubts from the best brains in the business. This we hope will stimulate intelligent discussion and inspired solutions to win this war against terror that you have pledged to fight with us. We can then be one step closer to creating an agenda that will bring about the change we need. • Why don't we empower the RAW to covertly sabotage the very structure of ISI and render it powerless, thereby destroying the engine of the whole terror mechanism? As an independent country, Pakistan has every right to have its own intelligence agency. We cannot question the right of Pakistan to have the ISI and give it a covert action capability. We should not target the ISI as an institution and its officers. We should target the covert action capabilities of the ISI and make them ineffective. Similarly, we should target the terrorist organisations and their leaders used by the ISI against us. We have not been doing this. Hence our problems. Ambassador Lalit Mansingh, India's former foreign Secretary and former ambassador to the US. • Is declaring war against Pakistan necessary for India? Why can't we go to the United Nations to solve the problem? The UN unfortunately does not have an effective machinery yet to deal with international terrorism. Besides, the UN Security Council is often deadlocked due to differences among the permanent members. For example, the banning of the Jamat-ud-Dawa (earlier the Lashkar-e-Taiba) was approved by the Security Council recently, after years of being blocked by China. The issue of Pakistani aggression in Jammu and Kashmir has still not been resolved, even 50 years after India took it up with the Security Council!. Brigadier Gurmeet Kanwal (Retired) is director of Centre for Land Warfare Studies, a Delhi-based thinktank, and author of 'Indian Army: Vision 2020'. • What should India do now as Pakistan has refused to accept proof on the 26/11 attacks submitted by the Indian government? The Pakistan government appears to be wilting under the heat generated by India's politico-diplomatic offensive and the newly-installed Obama Administration's pressure. However, going by past experience, Pakistan's recent assurances to bring the perpetrators of the Mumbai attacks to justice are merely a tactical ploy to buy time and nothing of substance will eventually emerge. If the Pakistan government fails to deliver within a reasonable time period of about three to four months, India should be prepared to upgrade its diplomatic offensive to exercise its military options. Hence, India should keep its powder dry. Air Marshal ( Retired) Kapil Kak, currently Joint Director, Centre for Air Power Studies, Delhi-based thinktank, formerly joint director, Institute for Defence Studies and Analysis and Air Adviser to the Chief of Air Staff. •Does the India army have all the modern weapons, security and communication system to defend our borders? Are our borders safe? Modernisation is a phased, on-going process, and our armed forces today have the requisite military capabilities to defend India's long borders against any conventional attacks by either China or Pakistan. The Kargil conflict (1999), in which India successfully countered Pakistani army intrusions, is proof enough. The problem, however, lies in the fact that the best of conventional military hardware could prove problematic against sneak intrusions by highly-indoctrinated and suicidal terrorist groups determined to breach multi-layered border defences. This is where vigilant in-land internal security structures - State police, dedicated counter-terrorism forces crisis-management teams and disaster-mitigation mechanisms assume great salience. 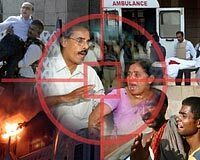 Mumbai 26/11 demonstrated some of our critical weakness in this regard.